I LOVE the feeling of marking another project off the list! And this one had been nagging at me for a long time. Well, let’s see…we got the fence up in April, bought the lumber in July and just stared at it for a few weeks. It took us three separate sessions and working past dark tonight, but we got ‘er done! 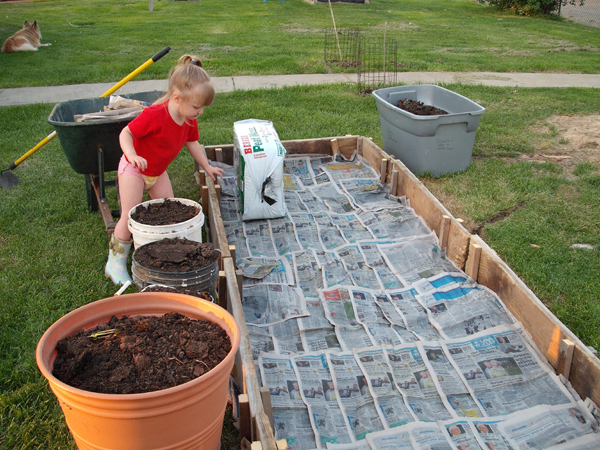 My husband and I are really getting good at working on these projects together. He’s the muscle and I’m the “measure twice, cut once” kind of gal. We balance each other well! Now to install a couple of strands of electric along the fence line, cage off the bees their own sector and build a small run-in and we’ll be ready for goats. You didn’t think we were going to all this trouble just for a couple dozen chickens, did ya? 😉 Although it does rest my mind to know the dogs can’t pick them off so easily now. I am also getting a new horse. Hopefully we can go pick him up tomorrow. 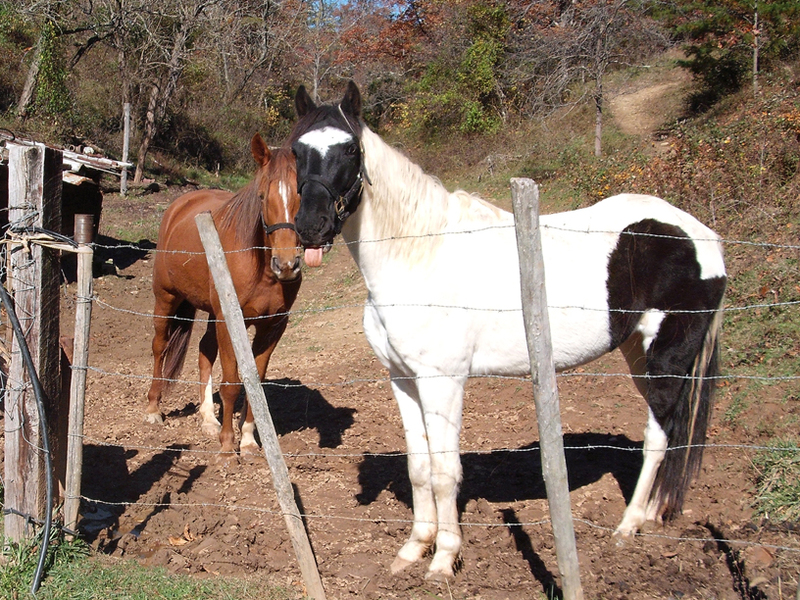 I was looking for a new pasture mate for my gaited paint gelding, Journey. 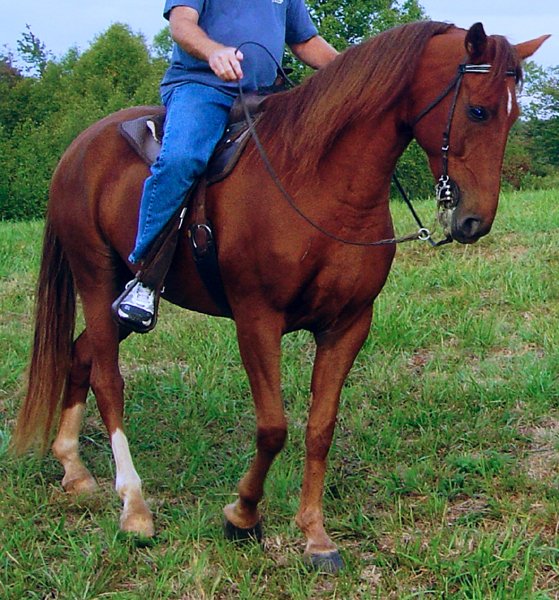 This new horse, Rocky, is a 12-year-old Tennessee Walker gelding. He’s on rehab from an injury, but is cleared for light work and to build up from there. He was free to a good home because his current owners needed to downsize. I will definitely post lots of pictures of him when we get him home. Here’s a picture that was forwarded to me. Isn’t he a looker! I’m debating whether or not to change his name. If you’ve got any ideas for a good name for this handsome boy, feel free to leave them in the comments section! 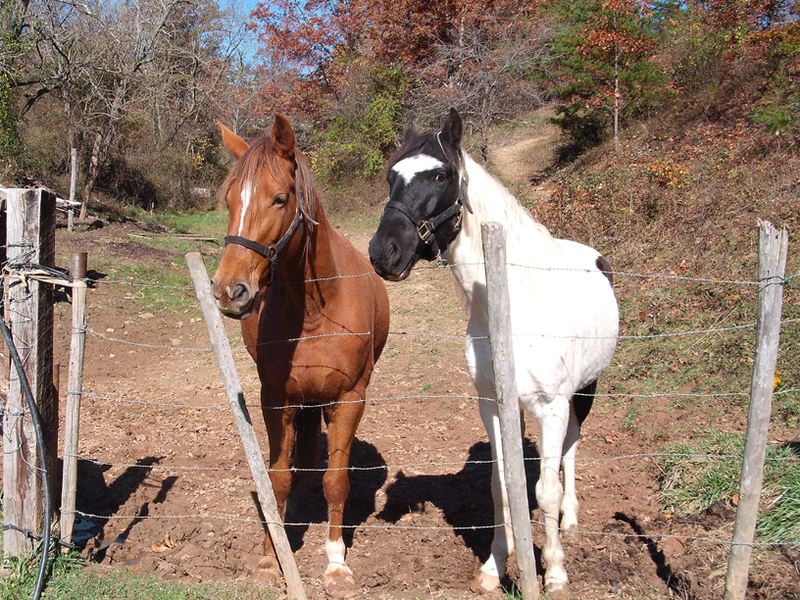 Now this is Journey (the Paint) and Lily, his old pasture mate (also a Tennessee Walker). This picture was taken in October of last year. I’ve had Journey since he was a colt. I won him at the County Fair on a one dollar raffle ticket in 2002. He’s a good boy and I love him. I hope that Ava can ride him in the Fair here in a few years. Now the horses don’t live here on the One Sunny Acre. They live on my Dad’s 44-acre farm 10 minutes down the road. 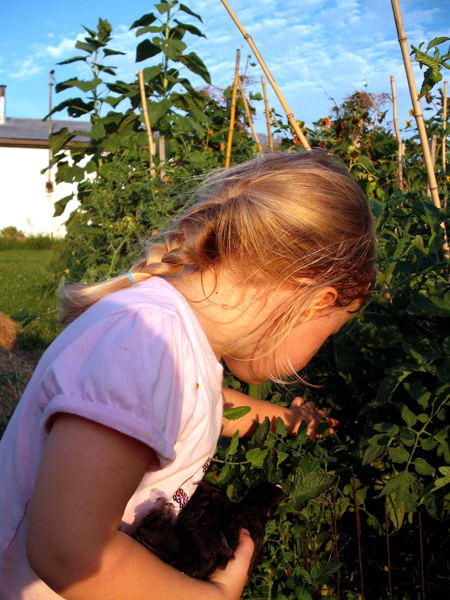 Persistence pays and my child is learning that at a very young age. 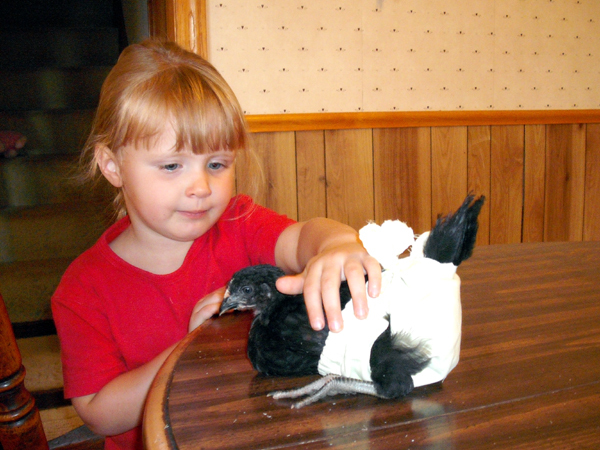 That’s how baby chicks grow…like popcorn. Round ’em up and move ’em on out! 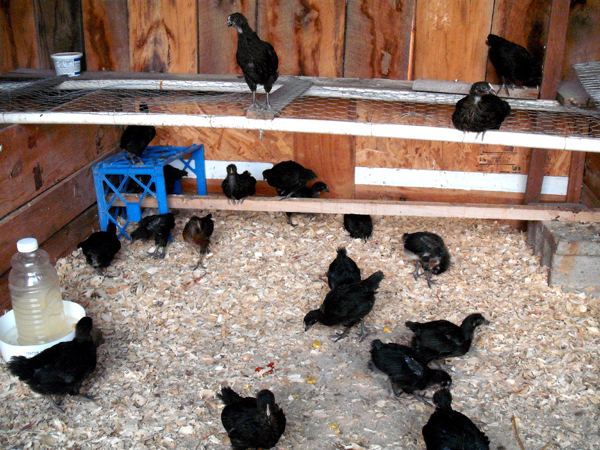 I moved my latest batch of chicks down to the chicken barn, still in a brooding pen, but a bit roomier. I promised my husband I would get them out of his garage before they started to stink or fly out and poo on everything, whichever came first, and I kept my promise! I’ve got a top on the brooding pen this year so they can’t get out. I don’t want them pooing on everything down there either. 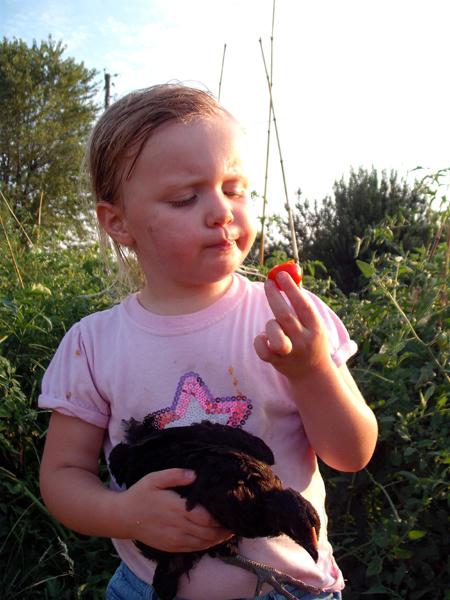 Because that’s what chickens do best, even the little ones. 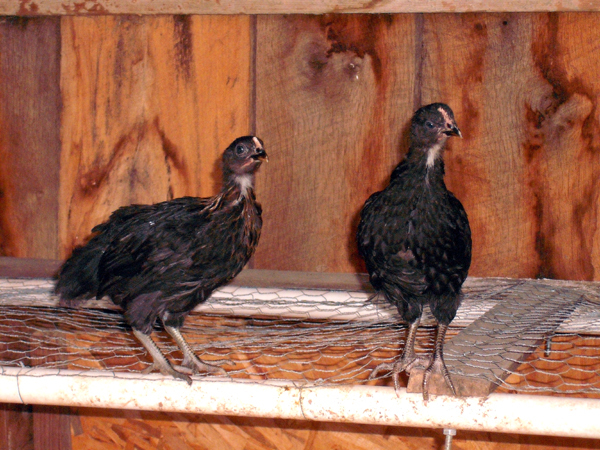 This year’s batch of chicks are 26 Black Star pullets. They are supposed to be phenomenal layers. I’m going to cull hard for quality this time. It’s been my experience that if they don’t get the kinks worked out after their first couple weeks of laying, they’ll lay weird eggs all along. I wanted to try Buckeyes this year, but you have to order very, very early to get them. They are critically endangered. 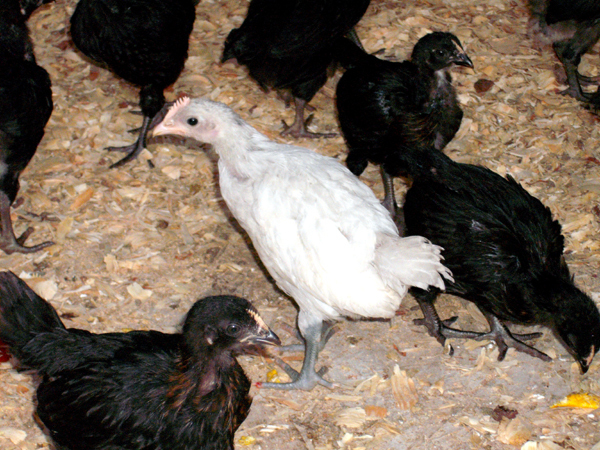 I am also interested in Black Copper Marans. 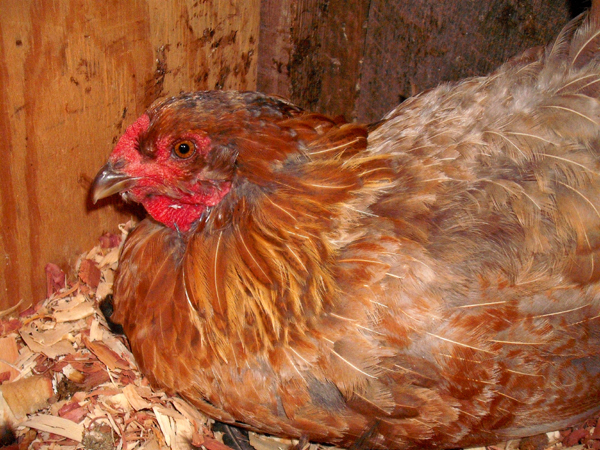 I want a dual purpose bird, but I still put a high priority on egg laying. I didn’t start them out down there in the chicken barn because sometimes I see evidence of a black snake in residence under the building. Brand new baby chicks are small enough to be eaten by one. 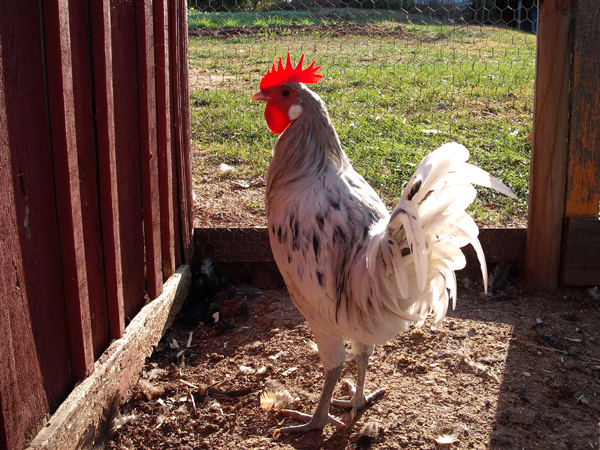 I leave him alone and he does his thing–and keeps the mice out of my chicken feed. It’s a good arrangement. I’ve learned my lesson the past couple years and we’re trying to socialize this new baby cockerel early. I think he’s going to be a Blue Andalusian. They offer you a “free mystery chick” with your order and you can pretty well count on it being a rooster. I’ve been letting Ava play with him and carry him around the yard with her. Ava calls him the “little lellow (yellow) chick”, but his official name is Little Boy Blue, for now anyways. 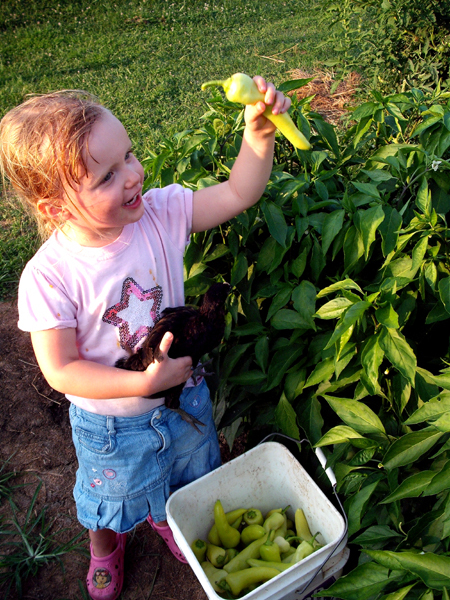 She’s been “babysitting” the chicks, but really they are babysitting her. I’ve been getting so much done here lately while she keeps herself occupied with a chick. 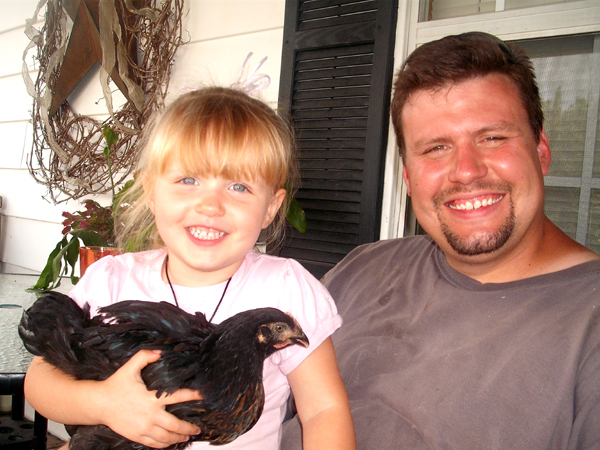 Every so often I make her go down to the chicken barn and switch out for a new “fresh” one. 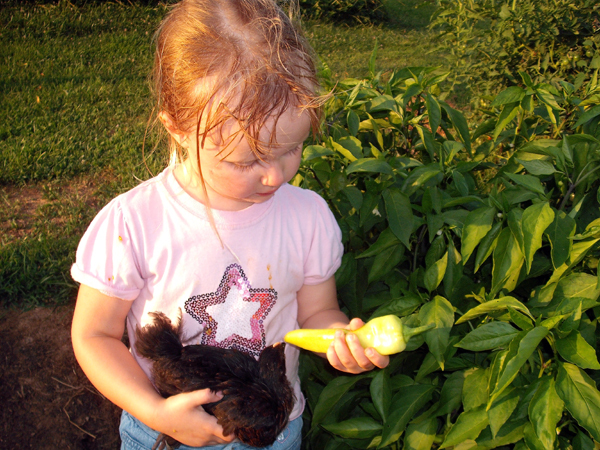 She has called the black ones (whichever one she happens to be holding at the time) “Renna”, which was the name of her imaginary friend, who is not so imaginary anymore now that Renna has morphed into being a “chicken friend”. These girls should turn out to be very tame. More fun than a barrel of chickens! 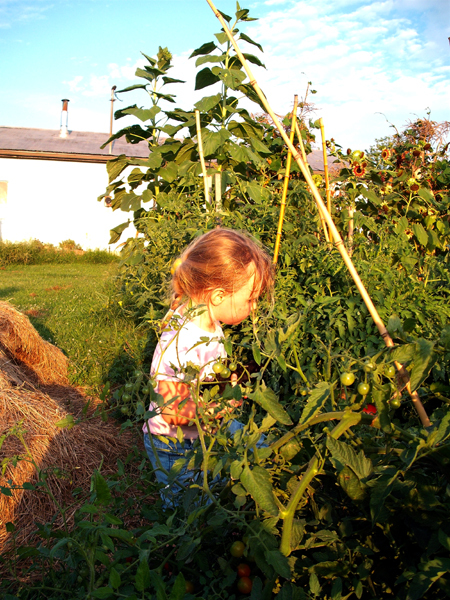 Please pardon my sweaty, dirty little farm girl. She does clean up well though. Ha. I’m still debating how to do this all-in/all-out thing with my layers. You can’t help but get attached to them when they’re around for so long. Most certainly you should not name them. Mark that one down in the lesson book–don’t name anything that you plan to eat. I’m thinking maybe as fall comes on, I will go ahead and cull the worst layers. Most of the girls will be going into molt anyway. I will maybe keep the best five throughout the winter to keep us in eggs. I can’t see any point in feeding the ones that don’t pull their weight, but it will still be hard to do. 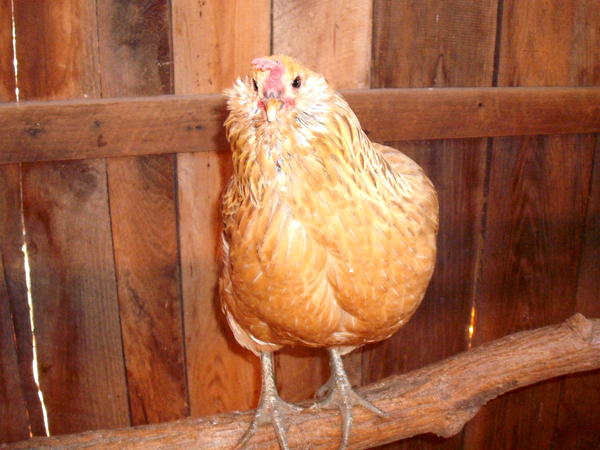 From here on out, I’m going to get all chickens that look the same, that way I won’t favor any. 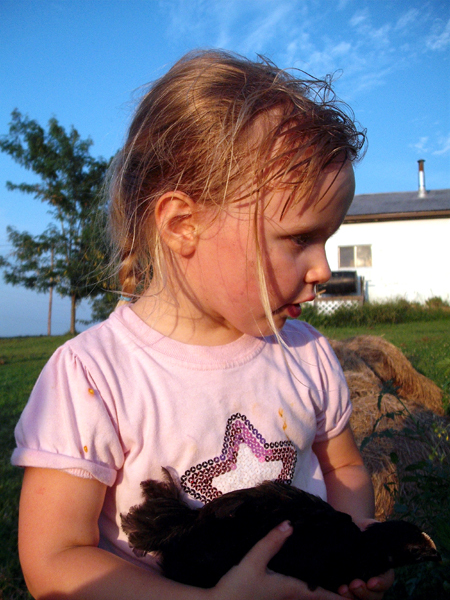 Speaking of butchering, it’s time to put in my order for fall broilers. I will be going with the Cornish X again. I have no complaints with them and those I’ve gotten from Murray McMurray Hatchery have always been strong and healthy. I had to buy a package of store-bought chicken breast the other day and it was seriously lacking compared to the quality of those we raised ourselves. I have just about used up all that I have in the freezer. I’m glad I made it as far as I did because we decided this year that fall broilers would be easier for us to manage and we’ll have more time to process them in the fall. I’m going to go ahead and order 35 again. 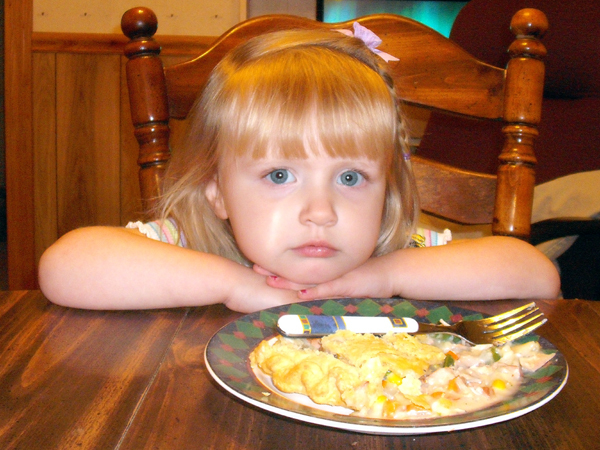 Last night I enjoyed a significant victory in the battle over picky toddler eating habits. 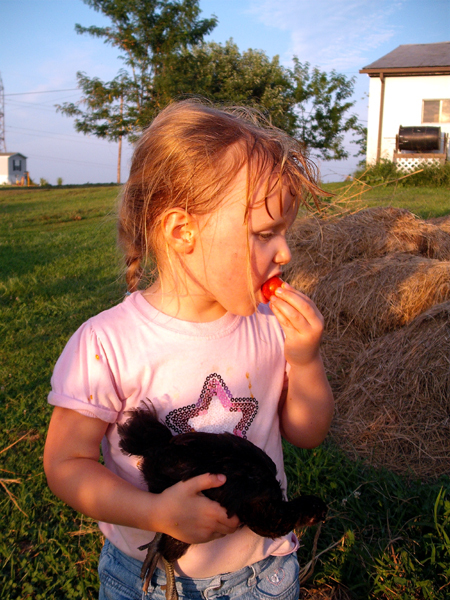 11 o’clock at night, my darling three-year-old finally ate her chicken leg. The whole thing. And she even found out that she likes chicken. Yes, I take it a little bit personal. Not only for having slaved over a hot stove, but because I personally raised, butchered and processed that little chicken leg. There’s no tossing it in the trash. Even the dog is not worthy to eat it. Prior to developing my winning strategy, the best I could do was eat it myself or pack it in daddy’s lunch for tomorrow. 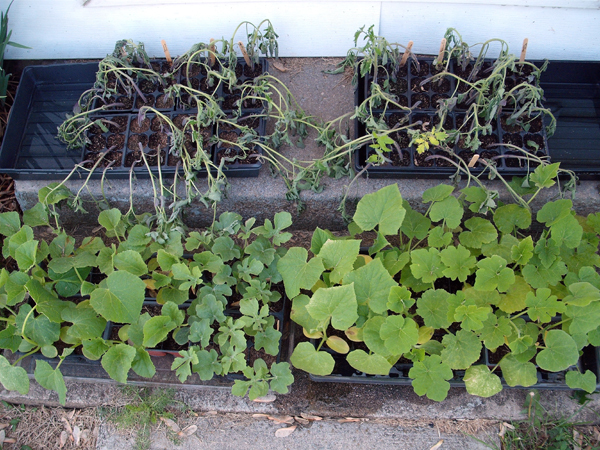 It places a whole other aspect of value on your food when you raise it yourself. I know how many hours it took, the sweat, the effort. I knew that chicken personally. Sure…I could buy it cheaper in the store, but it wouldn’t taste as good or be as clean and healthy. Nope, picky eaters will not be tolerated in this house. I am laying down the law. If you don’t eat your dinner, then there will be no snacks! I will wrap your plate and put it in the fridge. Just let me know when you want me to heat that up for you! I still need to fabricate a double gate for the entrance, but as far as the chickens are concerned, they are well contained. I have a section of my PVC range pen blocking their exit for now, until I can get to it. I also need to brace the posts connecting to the gate. 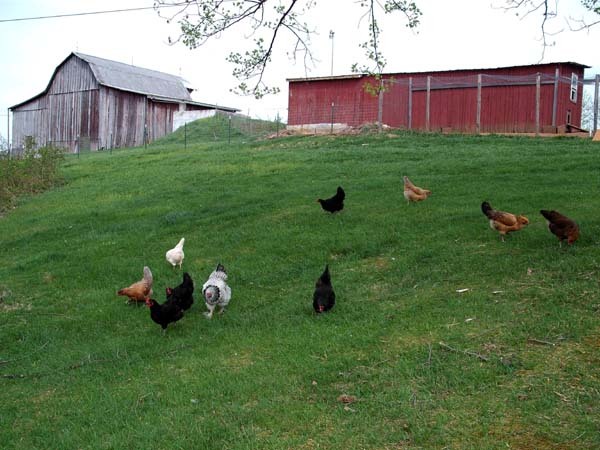 Here’s the chickens enjoying their dog-resistant free-range area. 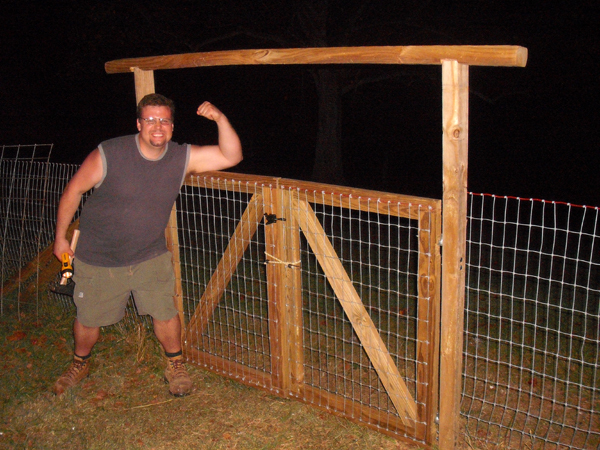 Good fences make good neighbors and now I don’t have to clobber any of mine (or their dogs)! The peace of mind was well worth what I paid for it. I got a very good deal on this 2″x4″ knotted woven wire horse fencing at Tractor Supply. I got 200 feet of it for $10 less than what I would have paid for 150 feet (3 fifty foot rolls) of inferior quality regular woven wire. The knotted fencing will last forever and not rust. 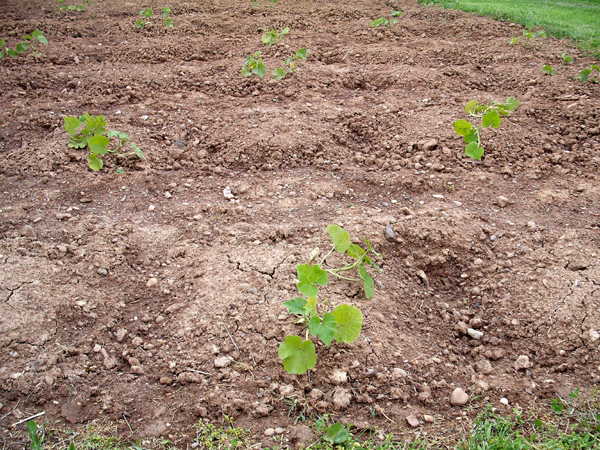 This area will also double as a small paddock for a couple goats in the future.